It's one of our favourite issues of the year: our big fat preview! This time we've dedicated even more pages than ever to charting the best releases coming your way in the new year, everything from Japanese zombie movies to blockbusting anime. There are 54 epic titles to read up on - make sure you've got your highlighter ready to mark off your favourites! Persona hounds shouldn't miss our flipper coverage of the new rhythm games - how do they make them so addictive?! And, if you're a total newbie to the franchise, check out our handy guide to get you primed. Don't be afraid to jump right in! On the festive front, our man in Japan is on hand to show you how to celebrate Chrimbo in the Land of the Rising Sun: everything from romance to Christmas cakes, to KFC! But if all our Christmas cheer is getting too much, why not jet off to Hong Kong with our guide to the festive period there? Or, if you've always fancied a trip to Japan, make that your new year's resolution with our guide to the top activities to do in Tokyo: this is our ultimate guide to ensure you don't miss a thing! 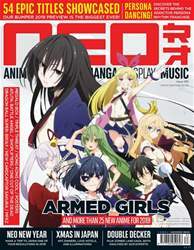 All that, plus our usual coverage of music, reviews, news, previews, manga and more - make sure you've got the latest issue of NEO to make it through Christmas intact!